You are here: Home » Gone to Trial for Holding a Sign? Gone to Trial for Holding a Sign? My name is Jeri Troia. I live in Madison. I am a substitute teacher. I come to sing at the Solidarity Sing Along on my days off during the school year, and as often as I can during summer. 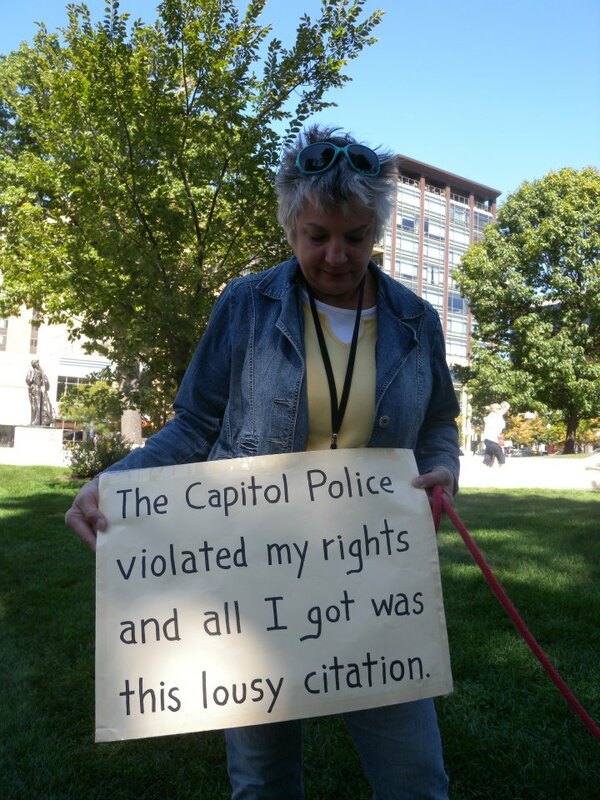 I’ve gotten two tickets from the Capitol Police. 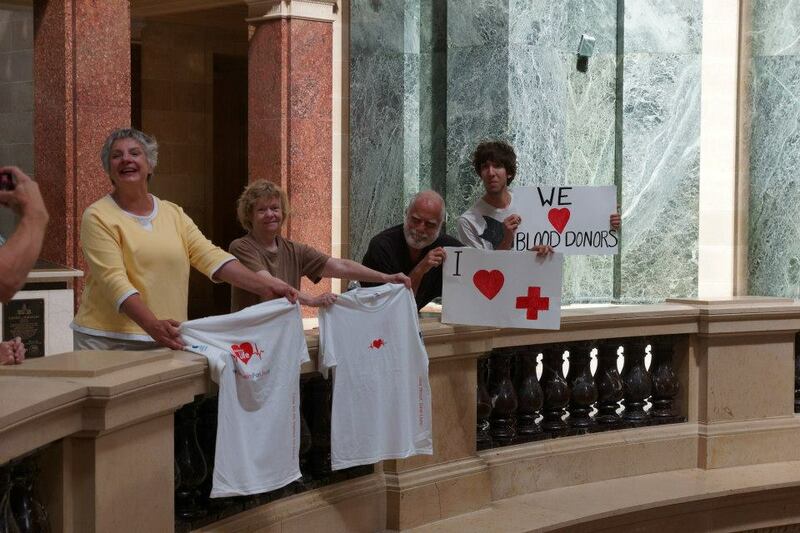 During a blood drive in September 2012, I was ticketed for holding a t-shirt that was given out by the Red Cross. 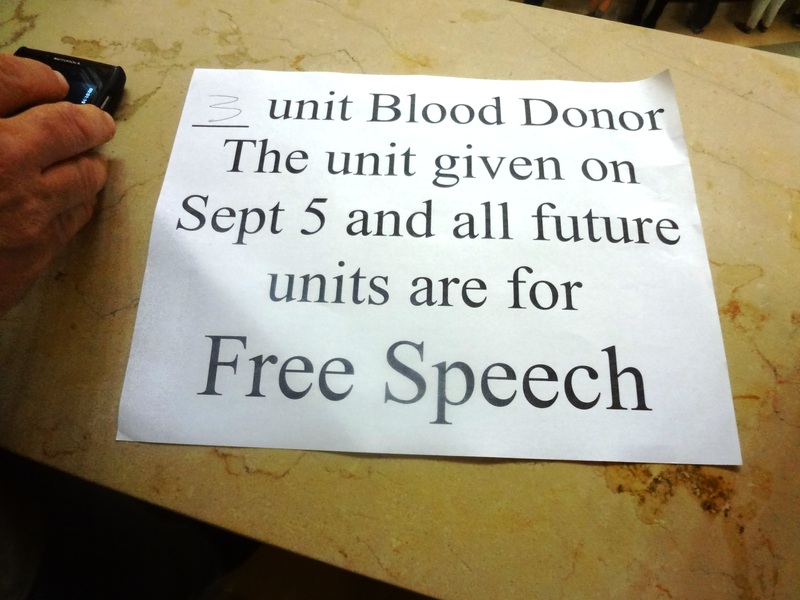 It said “Give Blood, Give Life.” I was on the first floor balcony, holding it over the railing, hoping, to catch the eye of Capitol visitors on the ground floor. I thought seeing the message on the t-shirt might nudge someone to come upstairs to give blood, or at least think about it. After about ten minutes, I looked over my shoulder, and I saw 7 or 8 police officers approaching. I was not told to put down the t-shirt. I was told to put my hands behind my back. I was handcuffed and taken into custody. At least four of those officers walked me to the elevator and took me to the basement. I didn’t know it at the time, but my friend Chris was handcuffed just after me, also for holding a blood drive t-shirt. We saw each other in the basement. After about 20 minutes, I was released with a ticket for $200.50. At the time, I had no idea that I would be the recipient of the 7th of more than 140 tickets issued, tickets violating our Freedom of Speech and Freedom of Assembly rights. My second citation was dated October 25, 2012, I was cited for “Obstruct Access or Passage”. When I’m at the Capitol, I almost always stand on the 1st floor balcony, at the railing. That day I was holding a paper sign and a red heart balloon. And I was singing. This time, my ticket arrived by certified mail. Surprise! $200.50 After the shock wore off, I thought about it for several days. As far as I could tell, I was ticketed just for being there. I was obstructing nothing. There was at least 10-15 feet of clear, open space behind me. Both my citations have been dismissed, about four months after I got them. FOUR MONTHS. They have been dismissed by request of Wisconsin Attorney General. The Wisconsin Department of Justice obviously knows they are bogus citations. Four months is a long time to be in limbo and have the emotional stress that comes with family in shock that I had been arrested. 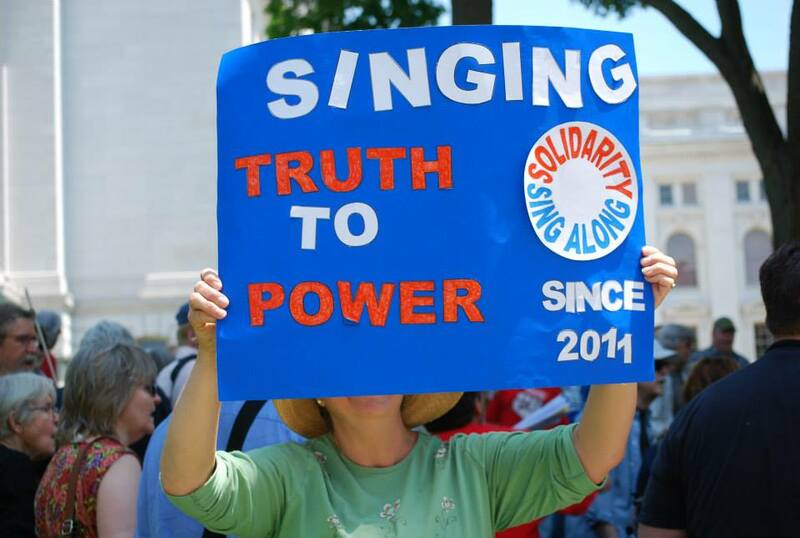 knowing that being convicted of singing could cost my family MUCH more than $401… just for petitioning my government. There seems to be no way to petition the party in power except by singing. Respectfully submitted in opposition to the rule changes to the Capitol Access Policy.